U.S. prosecutors have charged two former JPMorgan Chase bankers with conspiring to conceal more than $500 million in losses related to the bank's ill-fated "London Whale" trade. Javier Martin-Artajo and Julien Grout worked for the London arm of JPMorgan (JPMPRD)'s chief investment office. Martin-Artajo was head of credit and equity trading at the chief investment office, while Grout was a trader on the team that made the complex credit derivatives bet that ultimately generated losses of more than $6 billion for the bank. Bruno Iksil, another trader on the the team, will not be prosecuted after agreeing to provide U.S. authorities with evidence about the trades and to testify at any trial. The criminal charges are the first to be filed in connection with the losses. They include wire fraud, falsifying books, records and Securities and Exchange Commission filings, and conspiracy. When losses began to mount in March 2012, Martin-Artajo instructed Grout to hide the true extent from JPMorgan management, ultimately resulting in the bank overstating first-quarter earnings by several hundred million dollars, prosecutors claim. JPMorgan CEO Jamie Dimon initially dismissed press reports about potential losses at the office as "a tempest in a teapot," an assessment he acknowledged months later was "dead wrong." 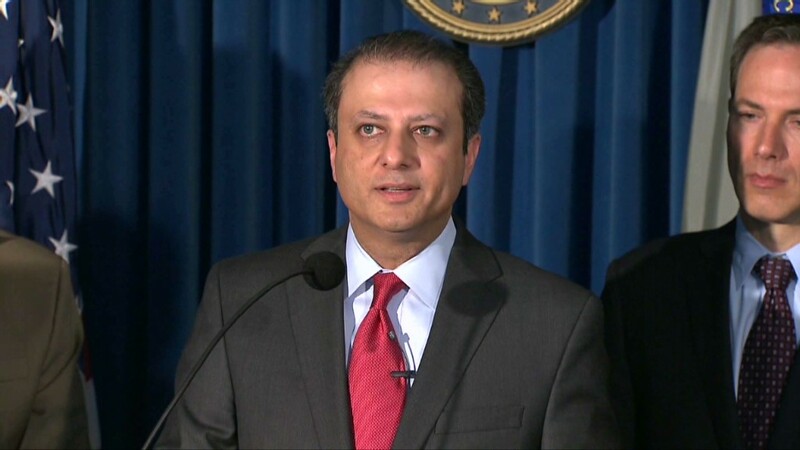 "This was not a tempest in a teapot, but rather a perfect storm of individual misconduct and inadequate internal controls," Preet Bharara, U.S. Attorney for the Southern District of New York, said at a news conference Wednesday. In a statement issued via law firm Norton Rose Fulbright, Martin-Artajo said he was confident he would be cleared of any wrongdoing. Grout's lawyer could not be immediately reached for comment. The losses on the London trades, which drew on federally insured deposits, stoked new concerns about the stability of big banks. JPMorgan has previously said it has recordings, e-mails and other documents that suggest traders may have been hiding the losses as they began to balloon. A report on the botched trade issued in March by the Senate's Permanent Subcommittee on Investigations said JPMorgan had "disregarded multiple internal indicators of increasing risk; manipulated models; dodged [federal] oversight; and misinformed investors, regulators, and the public about the nature of its risky derivatives trading." "While the transactions and financial products involved may be complex, the criminal conduct alleged is simple and straightforward," Bharara said. "The defendants deliberately and repeatedly lied about the fair value of billions of dollars in assets on JPMorgan's books in order to cover up massive losses." Grout and Martin-Artajo are currently abroad and have not yet been arrested. Bharara said he hoped they "will do the right thing and present themselves in the United States to face the charges that have been brought." Regulators at the Federal Reserve and the Office of the Comptroller of the Currency ordered JPMorgan in January to improve its risk management and internal auditing in light of the losses. The bank did not face any monetary penalty at that time, consenting to the order without admitting or denying wrongdoing. Ina Drew, the former head of the chief investment office, earlier this year placed much of the blame for the massive loss on London traders, who she said inflated the value of their positions and failed to calculate losses accurately. She defended her role, saying she did not engage in any misconduct. -- CNNMoney's Emily Fox and James O'Toole and CNN's Evan Perez contributed reporting.